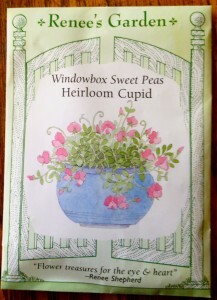 'Heirloom Cupid' Windowbox Sweet Peas, from Renee's Garden. Gardening friends, my first order of seeds for 2012 just arrived in the mail. These are from Renee’s Garden, a California-based company. Renee Shepherd, the gardener behind the company, sells heirloom and gourmet vegetables, aromatic herbs, and cottage garden-style flowers. I’ve never been disappointed in any of her seeds, which you can find at some retail stores, or order online (she doesn’t offer a mail-order catalog). Unfortunately, Renee’s site doesn’t list which retailers carry her seeds. That’s probably because it’s too hard to keep that kind of information updated. But you can email her, at customerservice@reneesgarden.com, to try to locate a nearby source. Or simply order online, which is what I do. Renee’s site is packed with great info, like recipes, gardening tips, info on making herbal teas and vinegars, and much more. There are also links to magazines and newspapers that have interviewed Renee about gardening. After reading this New York Times piece on growing alpine strawberries, in which the writer describes picking the tiny, fresh berries and eating them with cereal and milk, I can hardly wait to try them. Most of the seeds I ordered should be planted in April or later, because they’re frost-tender. 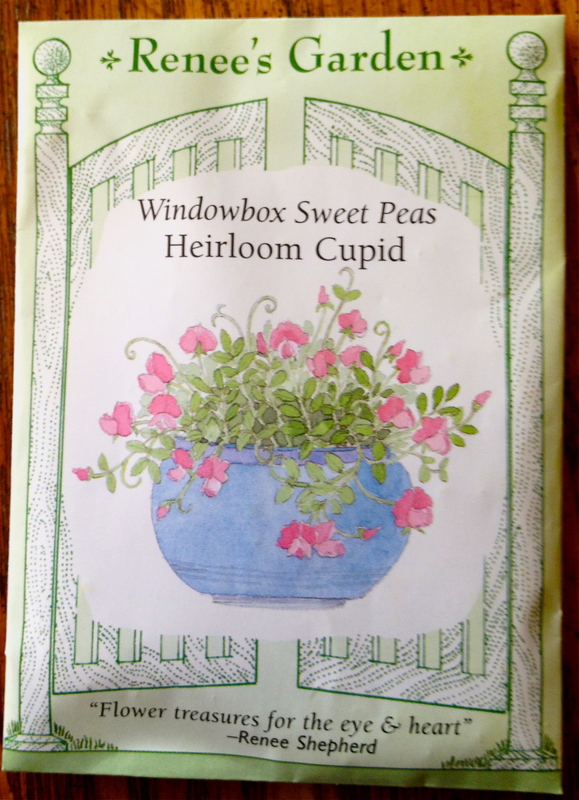 But I did buy a variety of sweet peas called ‘Heirloom Cupid.’ I’m going to try growing them, even though our weather usually warms up fast in the spring, and sweet peas prefer cool temps (they can even handle light frost). The picture on the sweet peas packet charmed me into buying it. All of Renee’s packets started out as commissioned, original watercolors, and I love these flowers, which look heart-shaped and have a sweet perfume. This variety is also small enough to grow in window boxes or containers. Can’t you see giving a bouquet to your sweetie for Valentine’s Day? Of course, I have to be realistic, even though beautiful flowers get me carried away. Sweet peas can be started in the fall, but I missed that planting season. They can also be sown starting in February, but that means mine won’t be in bloom by Feb. 14. That’s okay. I’ll enjoy growing them and giving them to someone special anyway. I’ll let you know how they grow for me! I’ll have to look up that book, because I’d probably like it too. Have you read Garden Spells, by Sarah Addison Allen? (Hope I’ve spelled her name right.) It’s about a young woman who grows a garden filled with herbs and roses and a magical apple tree. There’s a romance in it, and it’s really delightful!